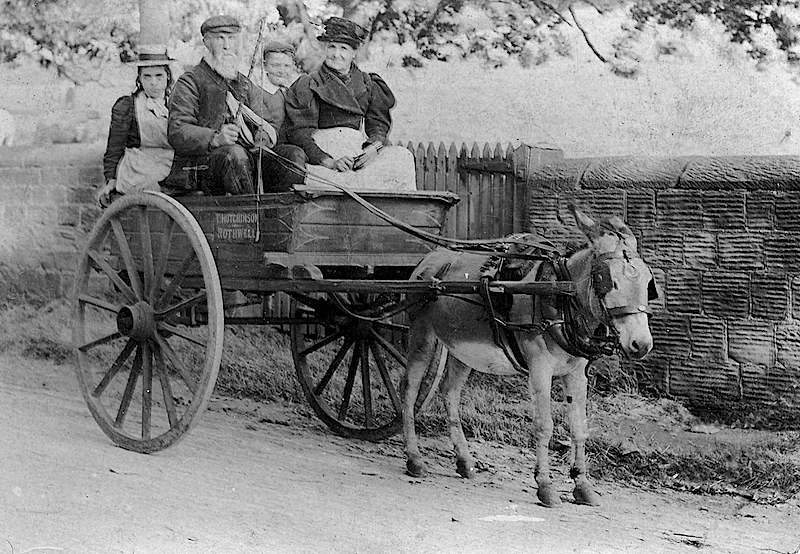 A familiar sight on the streets of Oulton and Woodlesford in the 1890s and in the early years of the 20th century was Tom Hutchinson and his donkey cart. Tom was born in Oulton in 1836. His father, Abraham, was a stone mason and Tom worked as a quarry man himself until the decline of the industry left him unemployed. By 1891 he had become a yeast dealer living at Dickinson’s Yard off Commercial Street in Rothwell. It’s not known where this photograph was taken but the date is about 1902 and shows Tom at the reins of his cart. 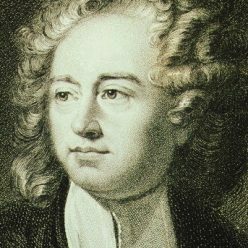 Sitting alongside him is his wife Jane Elizabeth. She was born in the Woodhouse area of Leeds, the daughter of waggoner Richard Dennison, and moved with her family to live at Methley and then Fleet Mills. 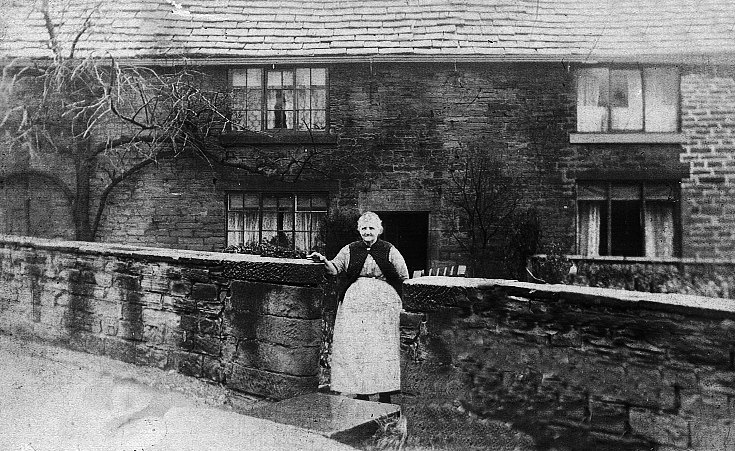 As a young woman she worked for an innkeeper in Hunslet before marrying Tom at Rothwell church in 1865 and for a number of years they lived at Ivy Cottage in Oulton. On the back seat of the cart are their grandchildren Hannah Josephine Hutchinson and Joseph Alfred Blackburn. Jane passed away in 1907 and Tom Hutchinson was 74 years old when he died in June 1910. 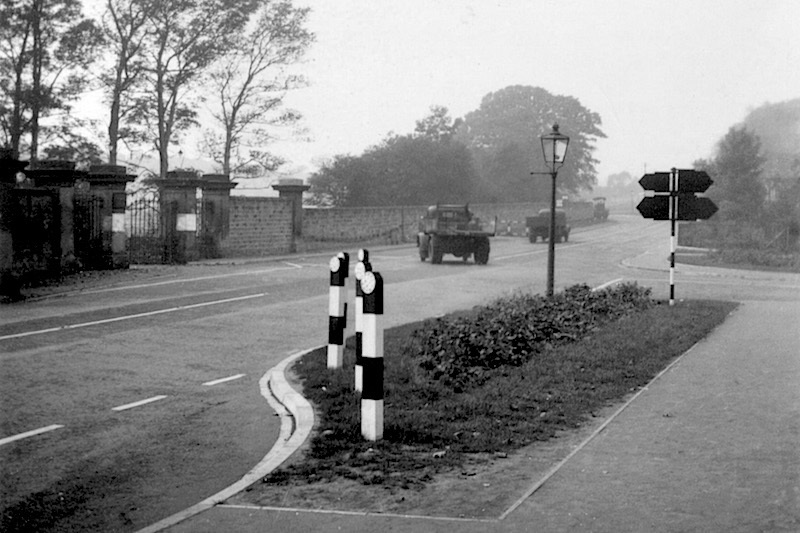 The junction of Calverley Road with Leeds Road at Oulton Lodge in the 1950s. A road roller is just visible at the corner of Rothwell Lane. 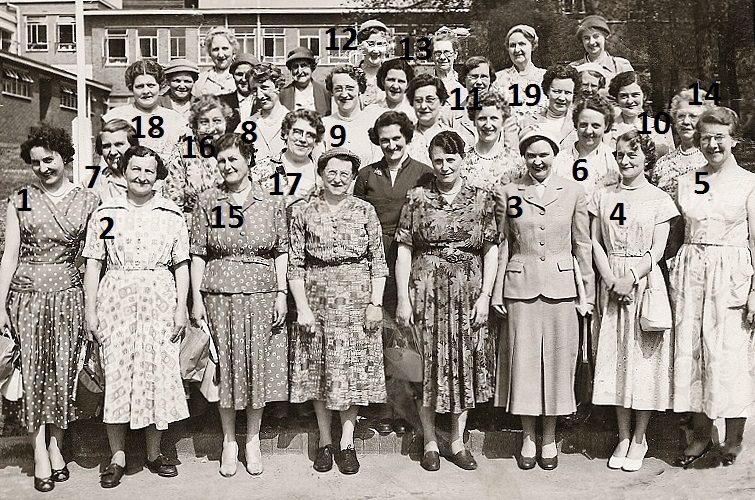 Oulton Mothers’ Union on a visit to the Wedgwood factory at Stoke-on-Trent in 1956. 1. Margaret Parkinson. 2. Margaret’s aunt, Nellie Walsh, nee Wilson. 3. Barbara Olden. 4. Joan Carter. 5. Ede Budding. Ethel Carter. 7. Catherine Butterick. 8. Mildred Grayson. 9. Mildred’s sister. 10. Mrs. Sadler. 11. Dorothy Ward. 12. Mrs. Wrigglesworth. 13. Elsie Mercer. 14. Mrs. Acaster. 15. Amy Wilson. 16. Ethel Parker. 17. Mildred Woodall. 18. Mrs. Angus. 19. Mrs. Manuel. Unnumbered next to 15. is Esther Jeffrey, nee England, and behind her in the dark dress is her daugher-in-law Mary Jeffrey, nee Pickering. 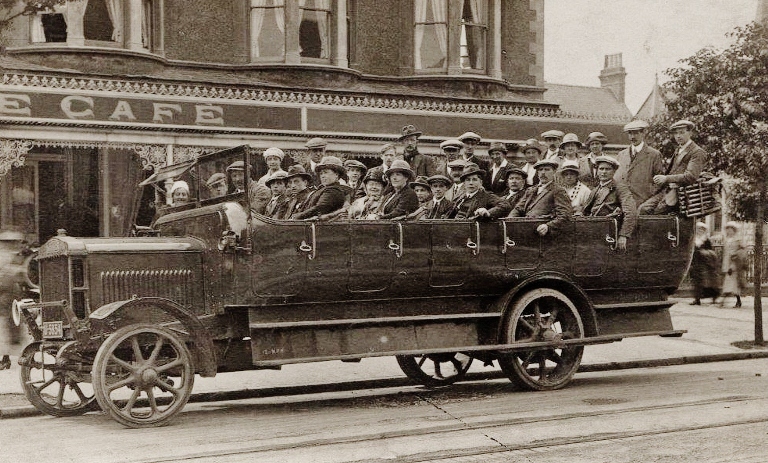 A charabanc trip to North Wales in the 1920s. Miner Percy Hammond from Oulton is sitting in the front row wearing a trilby hat. 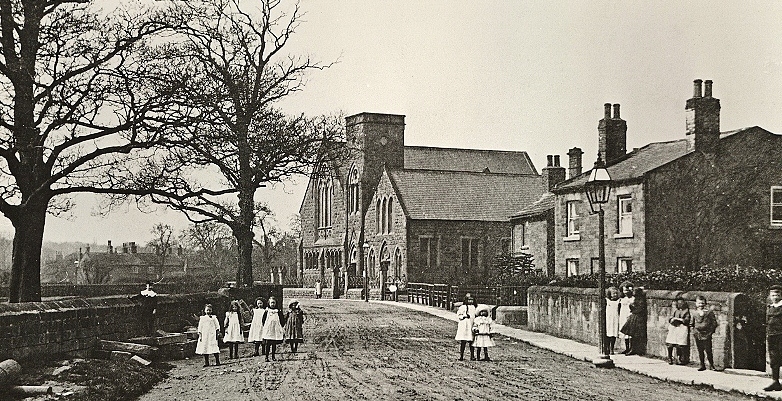 This photo was taken outside the grounds of Oulton Hall during the First World War. 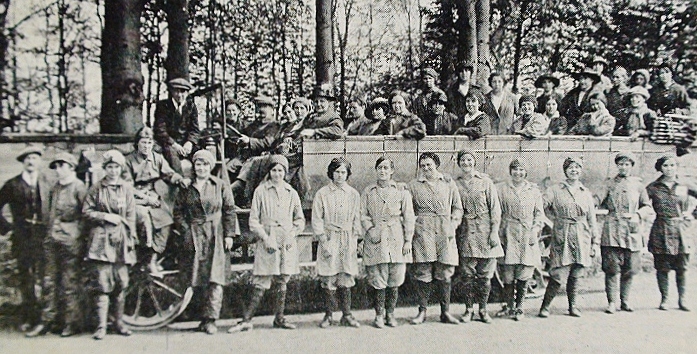 It shows a charabanc of local women on their way to work at the Barnbow munitions factory. An explosion there in December 1916 killed 35 women and injured many more but none of them came from Oulton or Woodlesford. Army Service Corps vehicles were used to transport materials to the factory from two outlying stores at Woodlesford and Royds Green. 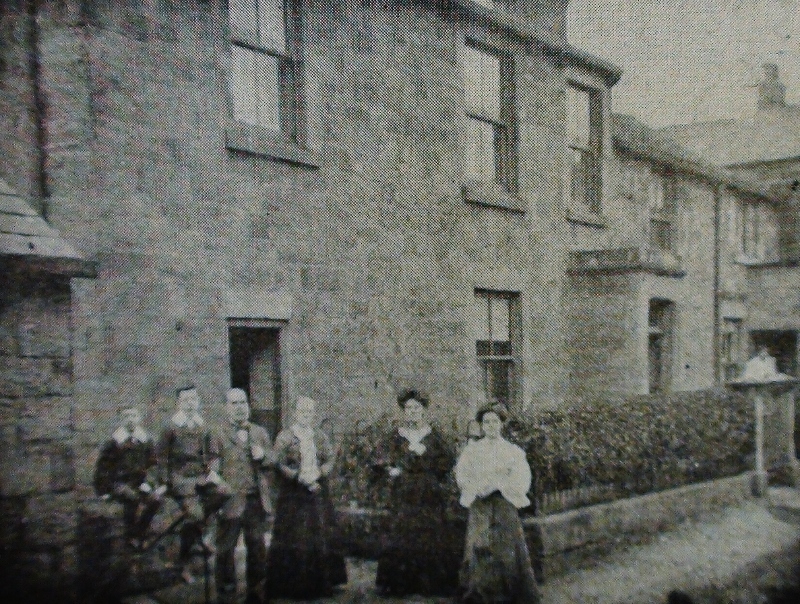 Inspector of Nuisances William Whitehead, in the centre, with his family outside their home at the Mill House on Holmsley Lane. The Needless Inn is in the background. The photo was taken before the First World War. The Bevan family pictured outside their home on Quarry Road, known as Teacake Lane, behind the Midland Hotel in the early 1900s. Third from the left is George Bevan, a miner who brought his family to Woodlesford from Dawley in Shropshire in the 1880s. He’s pictured with his wife, Annie Elizabeth, along with two of their sons, Albert and Willie, and two of their daughters, Alice and Daisy. At the time of the 1901 census Alice was 19 years old and working as a waitress in a pub restaurant, possibly the Midland Hotel. Daisy was 13 years old and still at school and from her appearance in the photo it suggests the photograph was taken slightly later than 1901. Another daughter, Clara, 17, was a pupil teacher in one of the local schools. Albert, on the far left, was 5 in 1901 but there’s a small mystery concerning Willie, who wasn’t listed as living at home in 1901. 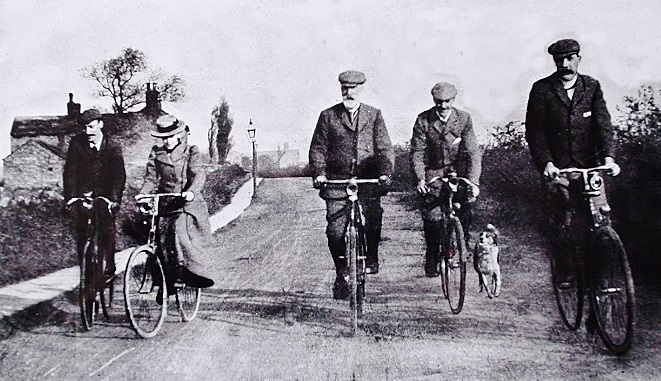 Neither does he appear in the 1911 census so he may have died after this photo was taken. It belonged to Marie Moore from Cornwall Crescent in Rothwell who identified the family for the Rothwell Advertiser in 1975. George and Annie had a total of nine children, two of whom had died by 1911. Their eldest son, William James, was born at Dawley in 1873 and followed his father into mining but later became an insurance agent. He worked for Pearl Insurance and then Refuge Assurance and after marrying Hannah Moore from Oulton in 1897 they lived in a number of places before returning to live in Rothwell. Martha, born in 1875, was a dressmaker when the family were living at a house in New Woodlesford on Midland Street in 1891. In 1895 she married John Moore from Oulton, a compositor at a newspaper or printing works in Leeds. By 1911 they were living at St. Mathias Street off Burley Road in the city. Continuing the tradition Alice Bevan married quarry labourer Harry Moore in 1912. Also that year Clara married railway clerk Frank Barlow Burnley. Another older daughter, Mary Jane, married bricklayer Charles Dickenson in 1899. George Bevan was 79 when he died in 1928. He’s buried at Oulton. 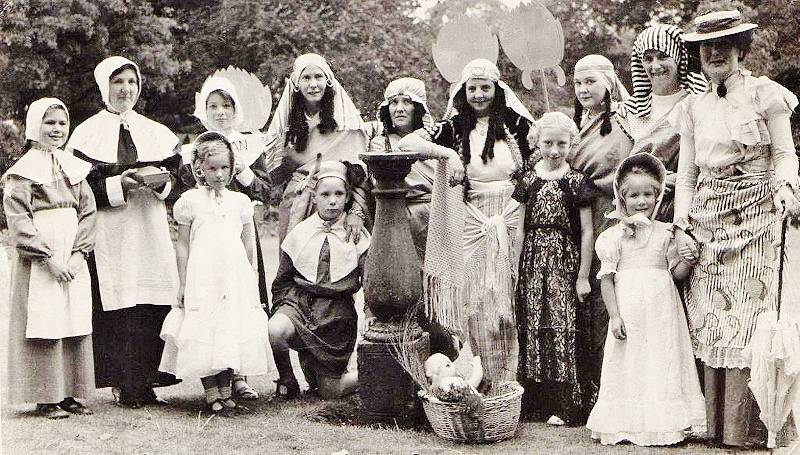 An Oulton carnival group in the churchyard in the 1950s. Alison Butterick is holding the “Puritan” sign. Her mother, Catherine, is standing behind the sundial with a Mrs. Carter to her right. 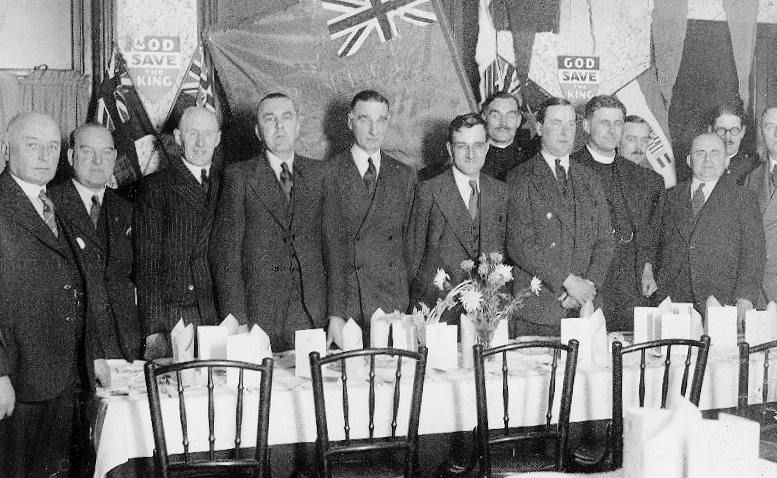 British Legion annual dinner, 1938. Tom and Margaret Wilson outside their house at the bottom of Quarry Hill opposite the Old Masons Arms. In the background is the entrance to the Oulton Institute. This photo was taken before the second floor of the Institute was added in 1912. Tom was the son of a miner and was born at Kippax in 1860. After working as a farm servant at Scarcroft Hall near Wetherby he married domestic servant Margaret Jeffrey at Oulton church in 1885. By the time the photograph was taken in about 1910 Tom was a coke oven labourer. Living with them was a lodger, George Cheeseborough, who was an onsetter at the pit bottom, and their two sons. The eldest, William, was a pony driver at the pit and and Harry was still at school. 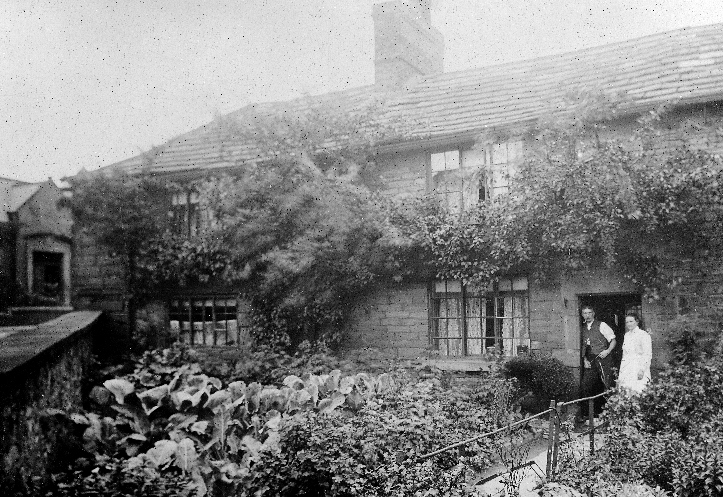 Its believed the cottage had been Margaret’s childhood home. Her father, William Jeffrey, was a gardener. Her eldest brother, Tom, was already a quarry worker when he was 13 years old. Another brother, Aaron, was a band finisher at the age of 10. Later they were labourers at Bentley’s gas works and then both of them became miners. Another view of the cottages at the bottom of Quarry Hill. 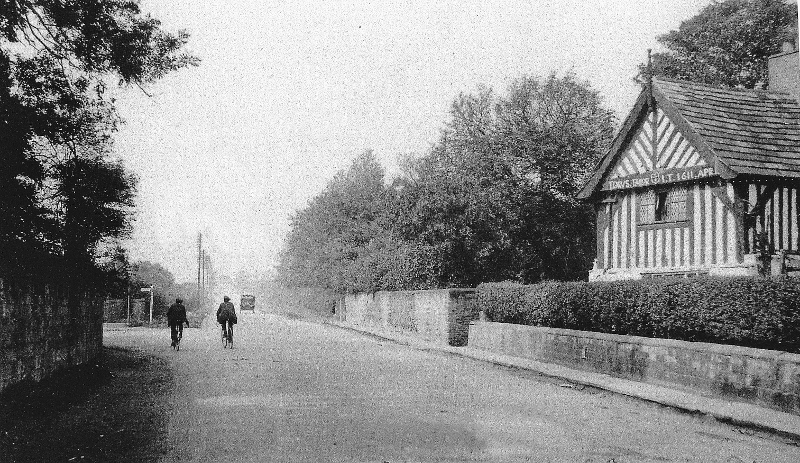 Calverley Road, Oulton. Hopewell House, on the right, was once a local beer house nicknamed The Jolly Toper. In the 1940s the Glazebrook brothers, who lived next door, discovered steps in the garden leading to an abandoned cellar. In the 1950s and 60s the house was the home of Dr. Mary Goodson who lived with her elderly mother and brother, and Mary Ann Maundrill who cooked and cleaned for them. The junction of Leeds Road and Rothwell Lane. The Nookin is on the right. 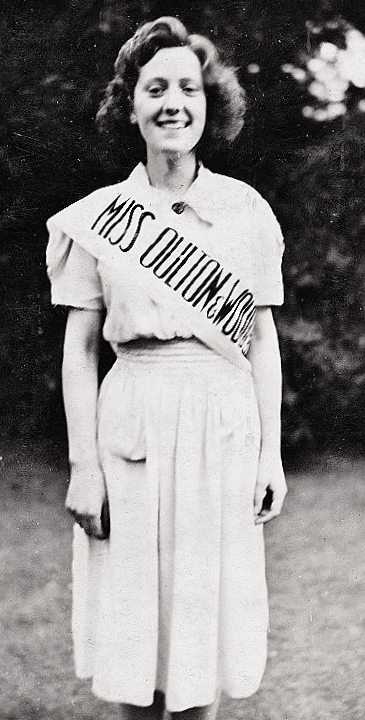 Marjorie Holdsworth, Miss Oulton and Woodlesford in July 1939. She won the contest at the annual garden party organised to raise funds by the Oulton-with-Woodlesford Hospital Committee. It was held in the grounds of Eshald House, home of Dennis Walter Hargreaves, the manager of Water Haigh colliery. Marjorie’s mother, Alice Lee, was the daughter of quarryman Ned Lee and had grown up living on New Row off Quarry Hill. In 1919 she married Wilfred Holdsworth from Holbeck. He was a presser in a tailoring factory in Leeds and they had probably met when Alice was working as a machinist before Wilfred joined up to serve with the King’s Own Royal Lancaster Regiment during the First World War. Marjorie was born in 1920 but her mother died when she was just a year old. When this photograph was taken she was living with her uncle, newsagent Ernest Lee, and his family at 40 Aberford Road. After her marriage in 1941 Marjorie moved away from the village. 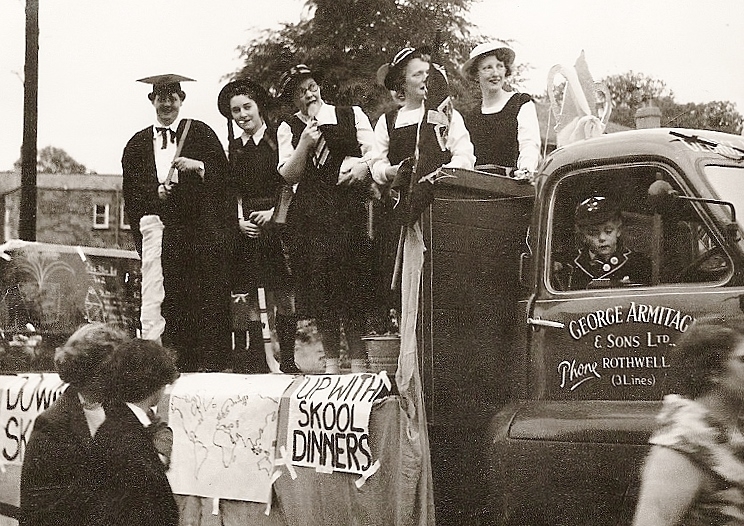 A carnival parade in Oulton in the 1960s.